Shree Vajreshwari Yogini Devi Mandir, earlier known as Vadvali, is situated in the scenic town of Vajreshwari. It lies on the banks of river Tansa in the Thane district of Maharashtra. This temple stands stoic on Mandagiri hillock. This hillock came into existence after a volcanic eruption. The presiding deity of this temple is Vajreshvari, also referred to as Vajrayogini. She is considered to be an incarnation of Aadi-Maya or goddess Parvati on earth. Her name actually means “the lady of the Vajra (thunderbolt)”. The original temple of Vajreshwari was constructed at Gunj – 8 km north of Vadavli. After being destructed by the Portuguese, the temple was shifted to its current location in Vadavli. The Nagarkhana (drum house) located at the main entrance gate was founded by Gaikwads belonging to Maratha dynasty of Baroda. Dipamala (tower of lights) and the 52 stone steps leading to this temple were built by Nanasaheb Chandavadakar, a distinguished moneylender from Nashik. The heavy stone walls surrounding this temple give it the appearance of a well-protected fort. Vajreshwari Temple is also known for its golden tortoise that lies on one of the steps here. It’s carved on the steps and leads one to the main shrine. Tortoise is worshipped here as Kurma. It is considered an incarnation of Vishnu in the form of a tortoise. 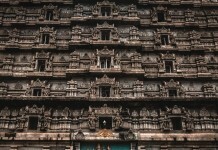 The main shrine boasts of three sections: a sanctum, the inner sanctum (Garbhagriha) and a pillared assembly hall or mandapa. The Grabha-griha has six idols. While the saffron idol of goddess Vajreshwari stands in the centre, other idols of goddess Renuka (Parshurama’s mother) , goddess Saptashrungi Mahalakshmi and goddess Vajreshwari’s vahana are located a to the left hand side of goddess Vajreshwari. 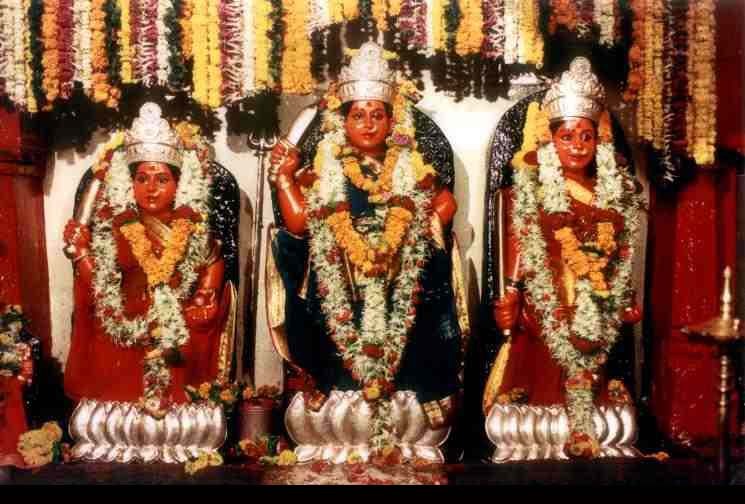 The idols of goddess Kalika (the village goddess) and sage Parshurama stand to her right. 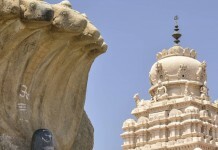 All the idols are adorned with crowns, silver umbrellas and silver jewellery. They stand on silver lotuses. A sanctum located outside the Garbhagriha boasts of idols of Bhairava, Hanuman, Ganesha and local deities such as Moraba Devi. The assembly hall is large and spacious Having a bell and a marble lion, which is the goddess’ mount. There are several other smaller but important shrines dedicated to Datta, Kapileshwar Mahadeva (Shiva), Hanuman and various saints belonging to the Giri Gosavi sect. This complex also has a 17th century samadhi (tomb) of Giri Gosavi saint Godhadebuwa. Vajreshvari Temple is also noted for its twenty-one hot water springs, which lie within a 5 km radius of its complex. The locals of Vadvali find mention in the Puranas (Hindu scriptures). It is believed that the region was visited by Avatars (incarnations) of Lord Vishnu (considered as the god of preservation): Parshurama and Rama. Legend says that Sage Parshurama had performed a large yajna (fire offering) in the precincts of Vadvali. The high hills of volcanic ash found in this area are the residues of his yagna. According to folk tales and stories attached to the temple, a demon named Kalikut or Kalikala used to trouble the humans and rishis (sages) residing in this region of Vadvali. He also waged treacherous wars against the Devas (gods). Distressed by his acts, the gods and sages led by Sage Vashishta had performed Tri Chandi yagna, which was a fire offering made to please the Goddess. It is said that once an aahuti (offering of ghee in the yajna) was not offered to Lord Indra, who was the King of all gods in heaven. This enraged him to an extent that he hurled his weapon, the powerful Vajra at the yajna. The gods and sages were totally terrified and invoked the powers of the goddess to save them from the wrath of Lord Indra. The Goddess came forth in all her glory and swallowed the Vajra. She also killed the demons and humbled Indra. After emerging victorious, she was requested by the sages, gods and humans to stay back in the region of Vadvali as Vajreshwari. The Vajreshwari temple was constructed as her abode on earth. Yet another legend believes that the Devas had once approached goddess Parvati to slay evil demon Kalikala. Goddess Parvati assured the Devas that she would arrive to their aid at an opportune time and asked them to wage a war against the demon. In the battle that ensued, Kalikala destructed and swallowed all weapons hurled at him. To stop the demon’s onward march into the forces led by the Devas, Lord Indra had to throw his Vajra. This ravaged Kalikala into pieces and set the grounds for the emergence of Goddess Parvati (who had effectively destroyed the tyranny of the demon). She was extolled by the Devas as Vajreshwari and a temple was built in her honour. Vajreshwari Temple is best known for its celebration of Navaratri. 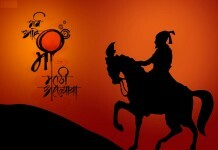 This festival falls in the Hindu month of Chaitra (March) and Ashvin (October). A large fair, organized in reverence to the Goddess, is also held on the new moon day of Chaitra. This fair witnesses ceremonial rituals of the Goddess, lighting of lamps and a procession with a Palki (palanquin). Other festivals celebrated in the temple include worshipping of Lord Shiva in Shravana, Diwali, Kojagiri Poornima – full moon day in Ashvin, Holi, Hanuman Jayanti, Datta Jayanti and Godhadebuwa Jayanti. Mumbai is the closest airport. It is located about 75 km from Vajreshwari. Thane Station (in the eastern suburbs of Mumbai) is around 34 km from Vasai Road Station and is the nearest railhead on the western side. Vajreshwari is easily accessible by road from all major cities in Maharashtra. Many state and private buses ply from Thane and Vasai Road Station. People desirous of visiting Vajreshwari via the western suburbs of Mumbai should follow Western Express Highway–Dahisar Checknaka–National Highway No. 8 to Shirsad–State Highway–Vajreshwari route. Those coming in from the eastern side should take the Eastern Express Highway–Mulund Check Naka–Nasik Road–Bhiwandi Bypass Toll–Bhiwandi Junction–Vajreshwari route.